Move over, aquatic aerobics. Stand aside, Pilates. After indulging ourselves with grilled meats, avocado salads, and lobster risotto dishes, we have no use for the kinder, gentler gym classes. 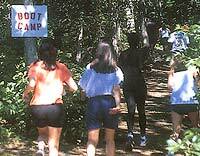 We're going to need something tougher to get ourselves back into shape; we need boot camp! One of the more successful trends in fitness training in recent years is the simulated drill-camp experience. At health clubs throughout the country, retired Army sergeants have found new careers dressing up in fatigues and sunglasses, and barking out calisthenics orders to weekly gym classes in need of extra motivation. Tough crowds bored with conventional workouts have latched onto the health craze in droves, and East Enders are no exception. For the past three years, Paul Frediani has been running his Hamptons Fitness Boot Camp on a spacious field beside, appropriately enough, the American Legion Hall in Amagansett. Two classes are held Saturday and Sunday mornings. The earlier class is more of a cardiovascular workout. There's a shaded area with mats, where he takes the workout when the summer sun gets too hot. 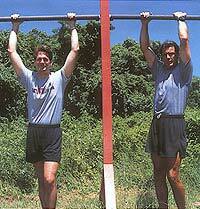 "Sometimes, if it's a beautiful day," says Frediani, "we'll go down to the beach and do exercises on the sand." Ah, what better backdrop for working out than the great outdoors? Not that you'll have time to enjoy the scenery and the fresh air--you'll be too busy gasping as you drop and give Frediani 20. 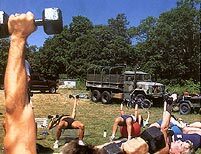 Part of the company Getfitnowcom, Inc., Hamptons Fitness Boot Camp is a grueling, hour-and-a-half total body workout based on the physical training regimens of the Army. "The U.S. military trains functionally," explains Frediani. "People use their own body weight." That means lots of push-ups, pull-ups, frog hops, medicine ball work, jumping jacks, sprint drills for speed and agility, and many more grueling treats, all served up with little sympathy. The bottom line, says Frediani, is stepping outside of your comfort zone. The workout is proof that you don't need expensive equipment to pummel your body. Frediani himself is no army dog, however. "Not unless you consider being a bugler in the Boy Scouts to be paramilitary," he laughs. In fact, he used to be a California surfer (he trained the U.S. Surf Team earlier this year in the Dominican Republic), who first came to the Hamptons back in the early nineties to surf. Believe it or not, there are some world-class waves right here on the East End. Frediani also is a trainer at Equinox Fitness Clubs in New York City, the author of several fitness books, and a former Golden Gloves boxer. He was originally approached to develop the Hamptons class by Andrew Flach, creator of a series of military-inspired fitness books, including The Official United,States Navy Seal Workout, The United States Marine Corps Workout, and The Official United States Naval Academy Workout. "When you look at the U.S. military," says Flach, "they've got hundreds of thousands of men and women who have to actively maintain their fitness. They have more resources than any other organization on the planet" to ensure that their fitness regimen is well-rounded and effective. "The Hamptons definitely has a large percentage of men and women who are really interested in taking care of themselves," Flach adds, "and they're tired of being in the gym all winter, on the machines and on the treadmills. They really want to get out there and be in the open air." And they're showing up--everyone from teenagers to people in their fifties, from beginners to gym hounds. And they're finding that the surfer-turned-boot-camp-instructor turns out to be much less brusque and more genial than people expect. "We're not really out to intimidate or punish people," says Flach. "It's not as if we're going to say, 'If you can't do five pullups, you're out of here.' The idea is, if you want to learn how to do one pull-up, we'll show you how to do that." "We actually wore cammies and combat boots the first year," adds Frediani, laughing, "but then we realized it's more comfortable to work out in shorts, T-shirts, and sneakers. Exercising can be kind of difficult in combat boots." 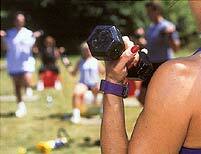 If you're tired of the gym, give the Hamptons Fitness Boot Camp a try. Classes are held at 8:15 a.m. and 10:15 a.m. every Saturday and Sunday at the corner of Abraham's Pass and Montauk Highway in Amagansett. The cost is $15 per class, or $135 for ten classes. For more information call (800) 367-2550, ext. 218, or visit www.getfitnow.com/hamptons.